Holidays are exciting! But going away can be stressful if you have chickens. Find out how you can leave your chooks without parental supervision in 5 easy steps. What do my chickens need while I am away? Less space leads to boredom. Bored chickens pick on each other. So if you are going for more that one or two nights, you should consider a larger space for them. Chickens should never be left alone in extreme weather. Heatwaves constitute a significant threat to your flock. The longer you're gone, the more important it is to have someone checking on your birds, even if it is only a quick look over the fence. These are some of the things to consider when you think of Caring for Chickens when you go away. Do I need a chicken-sitter? If you do need a pet sitter, remember that chickens are not like dogs or cats. The most attention they will need, even if you are away for a few weeks, is a quick morning and also evening visit. And chickens are even kind enough to provide their payment for pet sitting, in the form of lovely, fresh eggs. By following these guidelines, you can go away for a few days and know that your chickens will be perfectly fine without parental, or human, supervision. Water is always the biggest concern. Dehydration can arise quickly in the hot Australian summer. Even when you are at home dehydration is a risk in high temperatures. At a minimum, birds should have access to 500ml of clean, fresh water per day. In hot weather, closer to a litre may be needed. Whichever Chicken waterer option you use, ensure there is adequate water at all times. Avoid using open containers as a waterer for Chickens. They can cross-contaminate drinking water with chicken faeces. Also, they can topple over leaving the hens with no water. 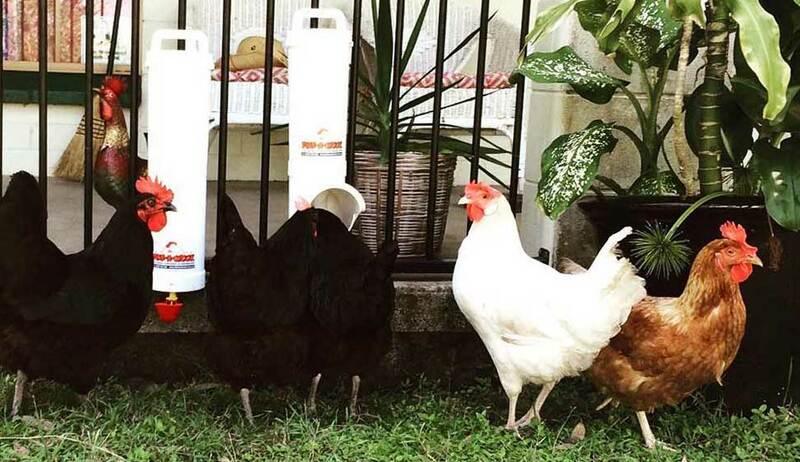 Our chicken drinkers come in a variety of sizes. Just make sure you have enough water to last an extra day. If not then you should have an additional drinker. Our Large drinkers can be made from our DIY parts and a 40-gallon drum. Our 20 Litre Drum Drinker contains enough water to keep ten birds happy for four days (at 500 ml/day each). If you have a garden hose or tap in your chicken coop, you may want to invest in an automatic drinker. Once it is set up, your birds will have clean, fresh water, straight from the tap. Also, you will never have to worry about dehydration again. Because hydration is critical to Laying Hens, having access to water from a Chicken Waterer is top on our list of Caring for Chickens when you go away. Chickens should not be left unlocked at night. Even if you have never had signs of a predator, they are simply defenceless if unlocked. If you have time to plan before you go away, consider the points in our article on Protecting your chickens from Predators. One solution to the security issue is an automatic chicken coop door, also known as an auto door. These generally are run by battery or solar. For more information on these, we suggest you make contact with your local Chicken Breeder or Farming Supplier. Ensure chickens have access to 120g - 150g of feed per bird, per day. Browse our Feeder and Drinker kits - with Automatic drinkers and 20-litre drums, to entirely equip your chicken coop before your holiday. Cooped up chickens are physically okay, but they get bored. And boredom = trouble. They might not rip up your cushions or chew your shoes, but chickens will pick on and peck each other. It may only be a few days, but providing your chickens with some amusement while you’re gone can help if they’re not going to be able to free-range. Whole sunflower heads, cobs of corn and big bunches of weeds, seed heads or greens make great piñatas too! And if you have enough room, making sure birds have a good-sized dust bath will also amuse – a kid’s paddling pool (the hard plastic kind) filled with sand is perfect. An extra couple layers of bedding on the chicken coop floor is also a great addition if you are going to be away. It keeps the coop that little bit cleaner, and gives your birds yet another thing to peck at that isn’t each other. Any chicken keeper knows that things don't always go as planned. Caring for Chickens when you go away doesn't have to be a major obstacle. A little planning as well as considering the important things will allow you more time to enjoy yourself. Are you interested in more how-to guides and special offers? Join thousands of other backyard chicken keepers on our mailing list. That way, you'll get chicken-keeping information, how-to guides and exclusive deals on Dine a Chook products. Join now for a special welcome offer!